Sizzling Sisig is one of the most loved companion for beer. It is said to have originated from Angeles City in Pampanga. This hot and crunchy mixture of pig’s ears, snout, brain and other innards is a staple pulutan favorite. 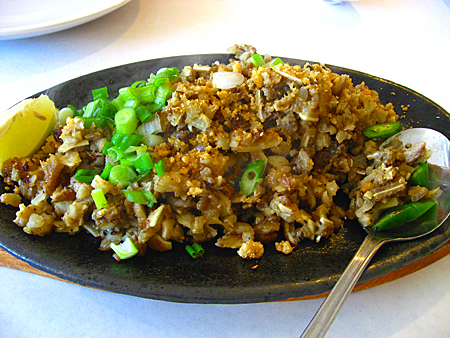 Sisig is served in an sizzling plate and topped with a raw egg. This Pinoy food can be eaten with a steaming plate of rice or by itself. There are other alternative of sisig available such as mixture of pork, tuna, chicken, bangus and tofu. Here is our tested pork sizzling sisig recipe. 1. Mix the pork cheeks, tongue and heart together with salt, water, pineapple juice and crushed black pepper. Boil and let simmer for about an hour until the meat becomes tender. 2. Drain and allow it cool in room temperature. 3. Slice the pork cheeks, heart, tongue and the liver into small 2 inches by 3 inches by ¼ inch cubes..
4. Place the pieces in skewers and grill. Wait until the pork turns brown and crisp. 6. Add and mix the marinade seasoning. Store the sisig in the fridge for 2-3 hours. 7. After 2-3 hours, take out of the fridge and cook in butter in sizzling plate. 8. While sizzling, you may or may not crack an egg on top. The sizzling plate with sisig will cook the egg when mixed with the food. 9. Sprinkle lemon juice and chili sauce on Sizzling Sisig. Top with chopped onion leaves. Click here to watch a video on how to cook Sizzling Sisig. The picture makes it look so good then you read what's in it, ugh, no way . It has to be in the eye of the beholder. The above is not sisig but from same part of the world and has parts of porky pig in it. Throw whole pig into wood chipper.